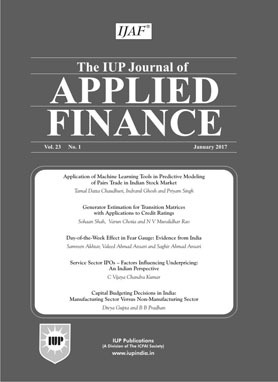 It is a quarterly journal that showcases empirical research in applied finance. It provides research papers on Business environment, Trade and free trade agreements, Tariff liberalization, Imports and exports, FDI, Equity markets, Debt markets, Corporate finance, Financial services, Financial risk management, Portfolio management, International finance, Bank efficiency and regulation, Structural transformation, Regulatory efficiency, etc. The main purpose of this paper is to examine the effect of turbulent environment on the financial and market performance of the industrial companies listed on Muscat Securities Market during the period 2010-2014. The turbulent environment is measured by the growth of sales of a company, while the financial performance is measured by net profit margin and return on equity. The market performance is measured by market fair value of a share. The findings of the study indicate that there is a positive significant impact of turbulent environment on the financial performance of a company, but does not have effect on its market performance. The present paper explores the contemporary and contested issue of relationship existing between the international capital markets. The scope of the study was limited up to five emerging equity markets of Asia, namely, India, China, Japan, Indonesia, and Taiwan. To examine the dynamic interdependencies of the selected markets, tests of stationarity and cointegration were conducted. Unit root test was done using Augmented Dickey-Fuller test, Phillip-Perron test and Modified Dickey-Fuller 't' test. It was concluded that all stock prices were integrated of order one, i.e., I(1). Cointegration test was done using Johansen cointegration test and Gregory Hansen test for cointegration. The VAR Granger Causality test was used to detect any causality between two stock market prices. The findings implied that no substantial relationship exists between the stock markets of the selected Asian countries. However, evidence of bidirectional causality between JKSE stock price and N225 stock price was found through the application of Granger causality test. This study examines the relationship among capital structure, ownership structure and R&D investments for Indian firms. The results indicate a positive relationship between R&D intensity and leverage of a firm, implying that Indian firms with high leverage do undertake R&D investments. Contrary to the existing literature, no negative relationship between family ownership and R&D investments is found. There is a negative relationship between institutional ownership and R&D investments, suggesting that institutions have a myopic view and concentrate only on short-term performance of firms. A negative relationship between domestic institutional ownership and R&D investments is also observed, confirming the general belief that domestic financial institutions do not finance innovative firms. Finally, a positive relationship between foreign institutional ownership and R&D investments is found. This confirms that foreign institutional investors do promote R&D spending in Indian firms and that they are dynamic monitors who support firms with innovative ideas and promote exchange of innovative knowledge. The main objective of this paper is to investigate the relationship between working capital management and firm performance of Indian firms for the period 2008 to 2016. The study also captures the role of financial constraints in defining the above relationship. The result indicates a significant negative association of net trade cycle, number of accounts receivables in days and number of inventory days on the financial performance of Indian firms while a positive relationship was found with number of accounts payables in days. Inclusion of financial constraints for studying the relation between working capital and firm performance gives mixed results.